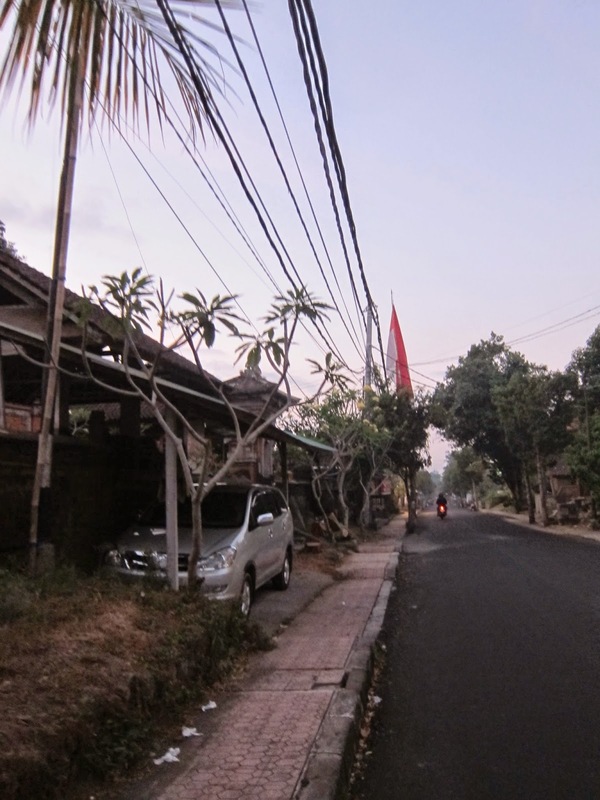 I came to Bali with the naïve idea that I would running to and from town on a daily basis. That any and every street would be scenic and smooth. That could not have been further from the truth. First of all, the sidewalks are narrow, usually only wide enough for one person going one direction. If you cross paths with someone, one of you needs to step out into the street to pass. The sidewalks are also impressively ill-maintained. Large potholes and trash abound. I had to stare at my feet the entire time I walked, because as soon as I looked up I was sure to trip on a stone or fall into a hole. If you think jogging on the roads is any better, think again. Traffic is Bali is the stuff of nightmares. Nearly everyone rides noisy and smoky mopeds, which they fill with home-brewed gasoline kept in Absolute Vodka bottles. Even if you manage to avoid not getting hit by a car on the road, you can’t avoid the noise and filth they emit. But wait, not all is lost. 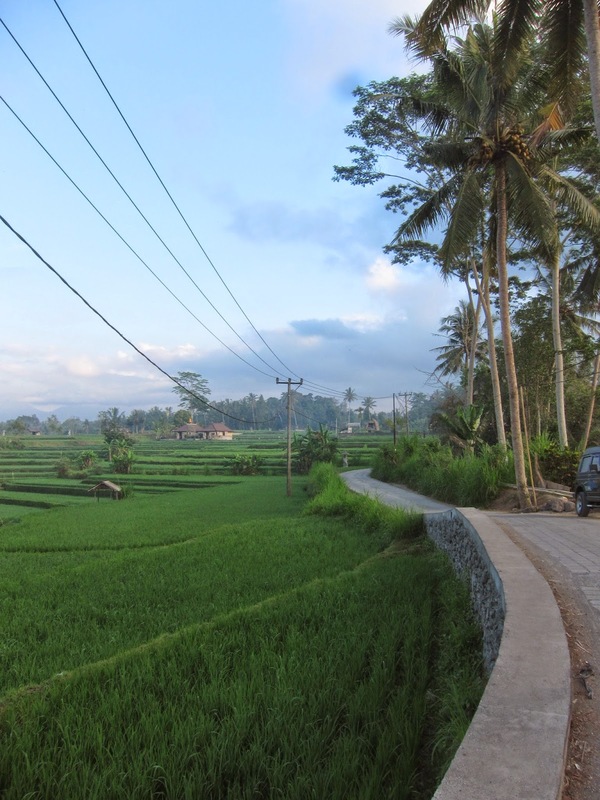 There is one running path in Ubud which is safe and quiet and serene. It’s not easy to get to, and you have to get up at 5:30 am, but it’s worth it. The trail starts at our house in a village just outside Ubud. A quick pre-dawn walk through alongside the narrow pathways between quiet rice fields. A circuitous routs leads to the main temple in town, located beneath the bridge. Walk behind the temple, then it’s straight uphill for twenty minutes or so. The route leads up to the top of a hill, alongside a river opposite of the town. From there you can watch the sunrise over the palm trees before descending into town. Mornings in Ubud are smoky, like walking through a dream. Although I'm awake the dream continues. You’ll pass by numerous luxury resorts and villas, the kind of places that appear in advertisements for Ubud. Then it is a slow decent downhill. No sidewalks, so you will be walking along the road, but at 6:30 am there are hardly any cars. The path leads back to our house, but you could easily modify it to go anywhere you want. 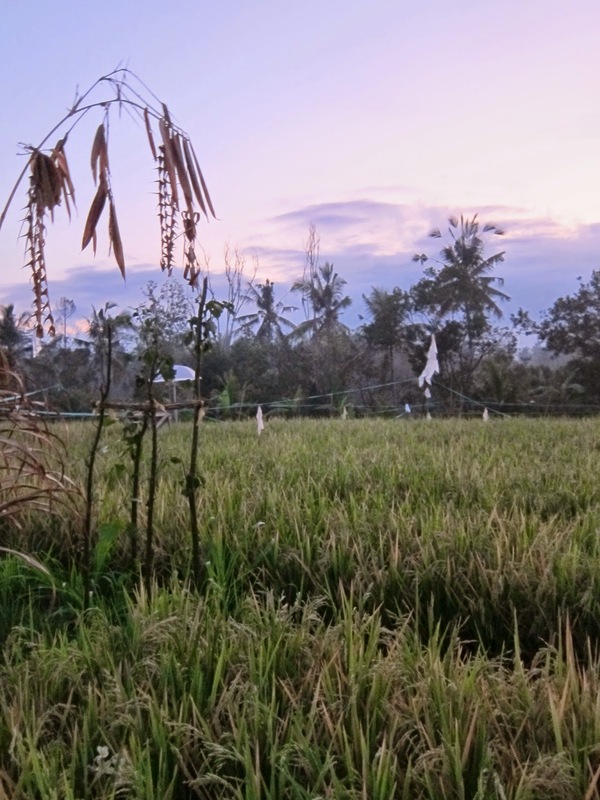 We did the entire 2-hour walk on our first morning in Ubud, then again in the evening, when we walked in reverse.